Since most of us have had a Biology class at one time or another, this may sound a little familiar. When naming an organism it will generally have eight parts to its name: Domain, Kingdom, Phylum, Class, Order, Family, Genus, and Species. This classification scheme begins with Domain as the broadest level, and then eventually narrows down to Species. These levels of classification help organize organisms into a hierarchy that makes understanding the relationship between organisms better. It also makes it easier to locate them in a phylogeny. There are three domains: Bacteria, Archaea, and Eukarya. 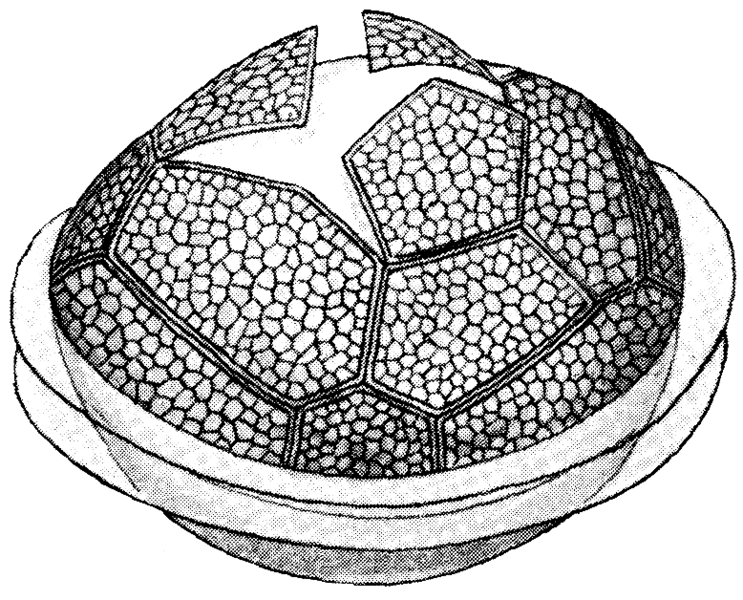 The defining characteristic of Eukarya is the presence of a nucleus. The nucleus is a cellular oganelle that contains the organism's DNA. Pyrocystis fusiformis is classified in Eukarya because it contains a nucleus. SAR includes the major clades of Stramenopila, Alveolata, and Rhizaria. 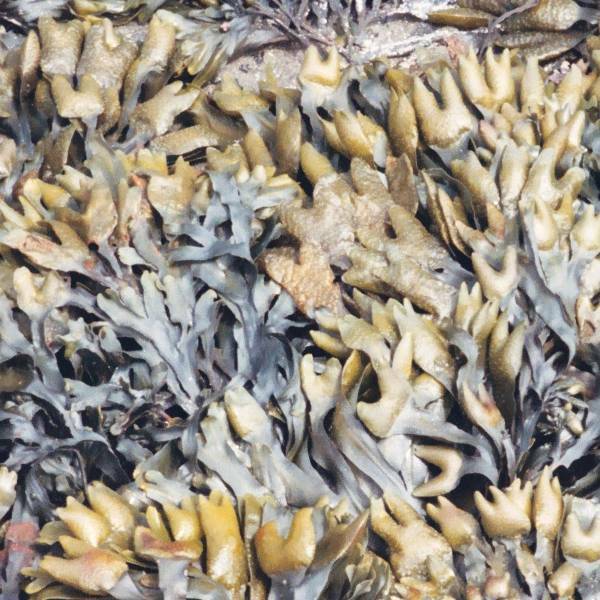 Ancestors of the SAR group engulfed an entire red algae plant cell, which became their chloroplast. This is known as a secondary plastid. Pyrocystis fusiformis is known to have a secondary plastid because its cholorplast has 3 membrane layers. Thus, it is classified in the SAR group. Pacific rockweed in the picture to the right is also a member of the SAR group. Pyrocystis fusiformis belongs to Alveolata due to the presence of theca plates, or cortical alveoli. These are large, flattened vesicles located underneath the plasma membrane. All organisms classified as Alveolata have these cortical alveoli. These plates act as a sort of armor for the organism. This organism belongs in the Dinoflagellata kingdom. All dinoflagellates have two flagella in at least one phase of their life cycle. They also tend to be unicellular protists (not plants, animals, or fungi). "Dinos" is Greek for whirling, so the name literally means "whirling flagella" (Campbell et al. 2008). Dinoflagellates earned this name because their paired flagella make them spin or whirl through the water. Pyrocystis fusiformis belongs in this kingdom because it is a unicellular protist that has the paired flagella in one phase of its life cycle. Many of the dinoflagellates are also bioluminescent as is Pyrocystis fusiformis. Pyrocystis fusiformis is in the phylum Dynophyta because it has two different flagella, one posterior and one transverse. The posterior flagella extends from a groove called the "sulcus" while the transverse flagella wraps around the cell (Delwiche 2007). Pyrocystis fusiformis is classified in Dinophyceae because when reproducing, its chromosomes remain condensed and do not expand. Class Dinophyceae is also known as the "Dinoflagellata of zoologists." 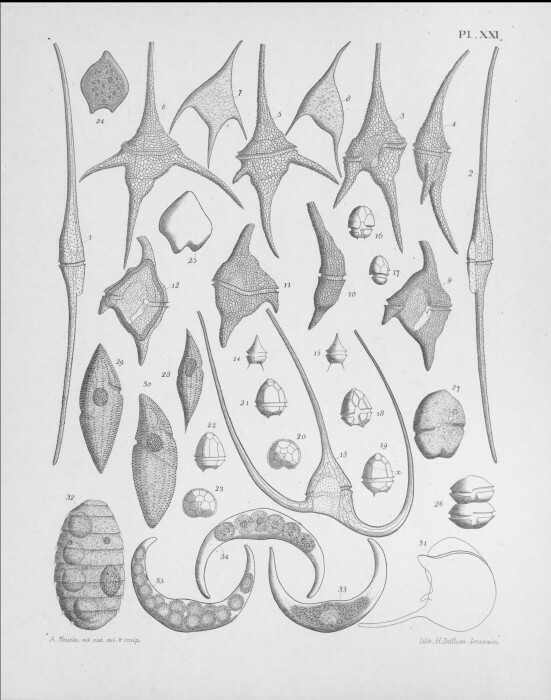 This class links ancestral dinoflagellates with standard morphology (Sarjeant 1974). This order was created by Apstein in 1909 and as recorded contains 18 species (Guiry and Guiry 2013). In the name of this order, it has the prefix of Pyro, meaning light. This is indicative of the bioluminescent species that this order contains. 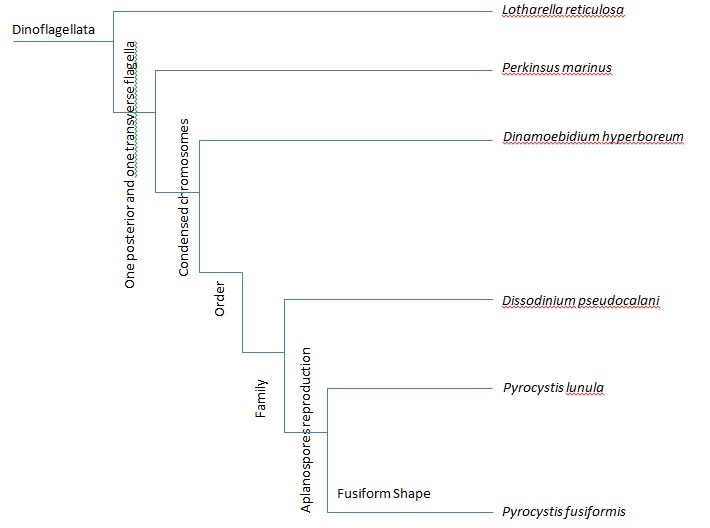 Below is a phylogeny of Pyrocystis fusiformis from kingdom through species, based on morphological evidence. This family was split into two different genera, Dissodinium and Pyrocystis. It was created by (Schütt) Lemmermann in 1899 (Guiry and Guiry 2013). Organisms belonging to this family are classified by their free-swimming dinospores. These dinospores eventually lose their flagella and thus the adult stage is non-motile (Sarjeant 1974). Organisms in this genus reproduce by aplanospores and have thecate in their motile stage (Elbrachter). There are two parts to this name, "Pyro" meaning fire or light and "cyst" meaning cell. Put together, the name "Pyrocystis" means lighted cell. This refers to its bioluminescent ability. "Cyst" could also refer to the fact that it reproduces by forming cysts. The full binomial name of this species is Pyrocystis fusiformis. This species is a bioluminescent unicellular organism in a fusiform shape, which is where its species name comes from. Fusiform is a shape that tapers at both ends (think of a spindle). 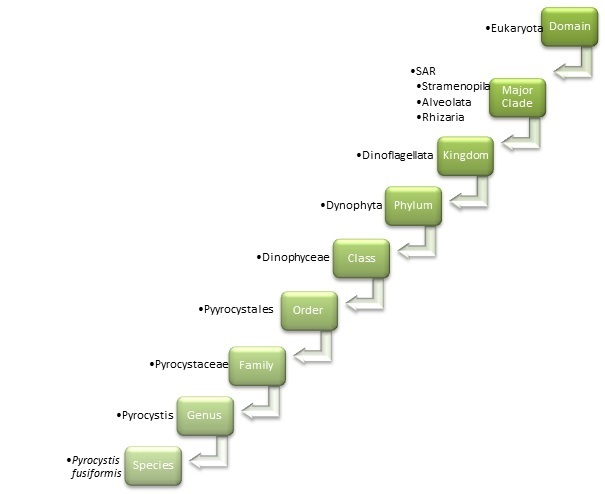 The following is a phylogeny of Pyrocystis fusiformis from Domain to Kingdom. Pyrocystis fusiformis is a eukaryote because it contains a nucleus. It belongs to Alveolata because it has cortical alveoli. It is a dinoflagellate because of its paired flagella and unicellularity. 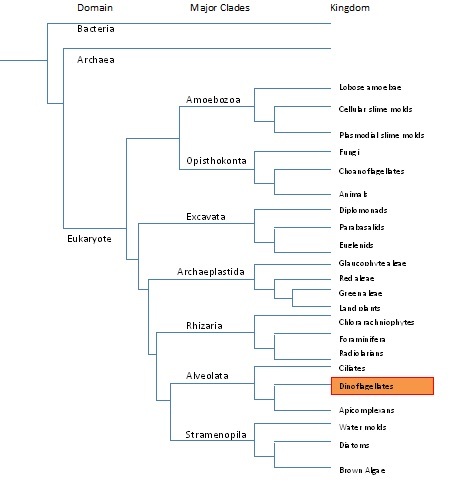 This phylogenetic tree is based on morphological evidence. "Wait, who is my Daddy?" Want to know where Pyrocystis fusiformis lives? Go to Habitat. 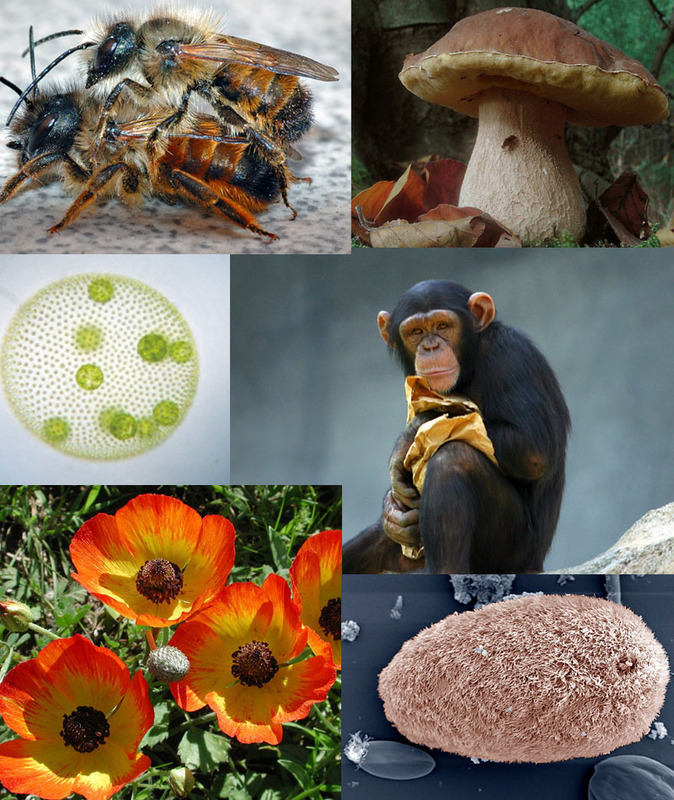 To continue your discovery of various organisms, you can visit other webpages created by Organismal Biology students at MultipleOrganisms.net. To visit UW-La Crosse's website, click here.